On Saturday, August 13, 2016, around 11pm, I walked away from my first experience with Eaux Claires (EXC). In that moment, I was already fully aware that something had shifted in me. I was different. As I began walking toward the exit, I was serenaded by Beach House’s The Space Song, a dreamy ballad which has been running through my head and heart ever since. When I think of it or hear it, I am immediately, inwardly, transported back to that moment. And, I remember how a music festival utterly wrecked me. Now, let me be clear, I don’t mean “I got messed up” at the festival. I’ve never been to other local music festivals (i.e. Country Jam and Rock Fest), but I understand there’s a pretty serious party vibe at each of them. I did not sense that vibe at Eaux Claires. No, I didn’t get high or drunk. I was wrecked emotionally, deeply and personally impacted by what I experienced that weekend. When I arrived at Foster Farms around noon on Day One (Friday, August 12), I could immediately sense there was something special in the air. I couldn’t define it and didn’t really want to. Even before the music began, I was glad I was there and I felt, in a sense, I belonged there. That sense of belonging only increased over the course of those two days. Now, I could offer a play-by-play of every show I saw, every piece of art I witnessed, and every nuance of the overall experience, but I’m not going to do that. 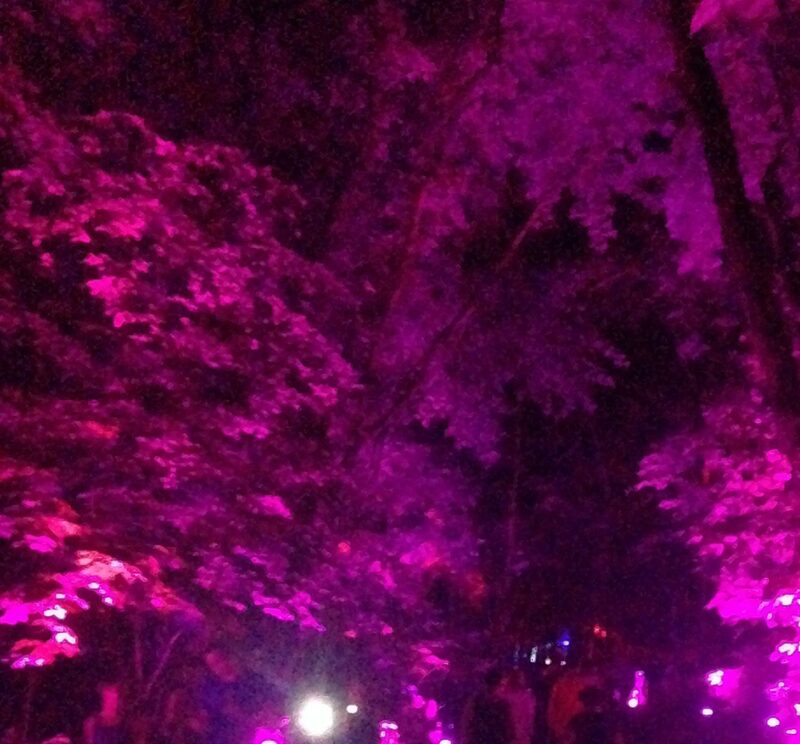 But I will say that everything I experienced at Eaux Claires only served to bolster that feeling of belonging. That feeling was affirmed further during Phil Cook’s set on Saturday. While I certainly enjoyed his music, my heart deeply resonated with a simple statement he made in between songs: “Music is sacred.” I responded with a holler and clapping, which could otherwise have been translated as my “Amen.” There is something transcendent about music, from its primary role in corporate worship for many religious groups to the fact it is an integral part of every cultural group in the world (at least as far as I’m aware). Music, and art in general, is special. There is something holy in creative self-expression. If you’ve read much of what I’ve written on Tomme Suab, you know how I feel about the importance of art. I believe God created everything and that he wired that creative DNA into each of us. So, when we are engaging in creative expression, or appreciating someone else’s art, there is something “sacred” happening. There is a connection with the Divine, in a very real sense. Regardless of what the creators and contributors of Eaux Claires may believe about these things, they created a Mecca, at least for me, of that connection, that sacred dynamic. And being there in the middle of that, being saturated by it for two days, moved me. I felt as though I belonged there, even as if I was meant to be there. Along with the sense of belonging, another dynamic I witnessed that weekend was the intentionality and purposefulness interwoven throughout every part of the festival (at least my experience of it). It was clear to me this was not intended to simply be a music festival. It certainly wasn’t meant to be a pretense for partying. It was a holistic experience, purposefully incorporating various genres of music and multiple other art forms (seemingly including the food options as well, which featured various ethnic and fusion cuisines). And there was an intentional connection with nature, which, in my mind, is the ultimate creative expression from the ultimate Creator. There also seemed to be a continual, purposeful flow between shows, performances, exhibits, and art installations (a flow which included shows starting when scheduled for the most part). The attention to detail inherent in the planning of such an experience was impressive. I mentioned the multiple genres of music represented at Eaux Claires. Now, I’m not much for categorizing musicians by genre or style. I hate the idea of boxing artists into a certain mold. But certainly, there were some highly identifiable styles there from southern folk/rock to hip hop to experimental orchestral to punk (and everything in between and around these). And on the surface, it may seem as though having such diverse styles on the same bill would be awkward or clunky. It wasn’t. I can’t really explain it, other than to say there was that unifying belongingness grounded in the creative expression connections mentioned above. That’s not to say that I connected with everything I heard in those two days. It really isn’t about that. It’s about how these diverse artists from diverse backgrounds playing diverse music were able to, somehow, collectively come together to inspire and challenge everyone in attendance (including other artists). 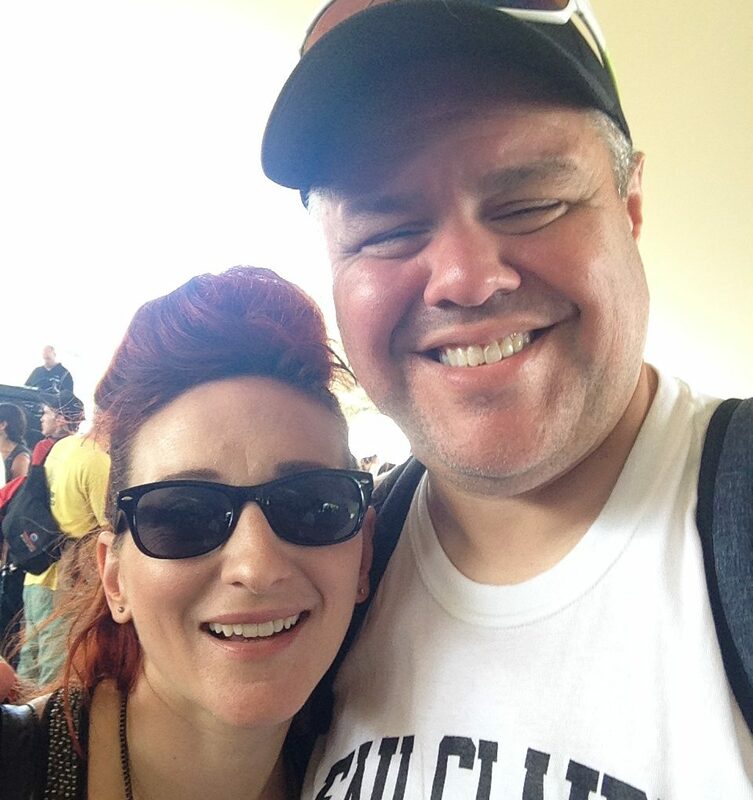 And maybe that collaborative diversity was the most compelling part of my Eaux Claires experience. As I come to understand more of Jesus and his message, I am beginning to recognize how important the idea of reconciliation is. I am beginning to comprehend how important it is to honor and celebrate our differences while learning to work with each other to create good things. At Eaux Claires, I got to experience that dynamic on a small scale, but it spoke to me in a large way. Now, without giving you a rundown of everything I witnessed those two days, I would like to highlight several pieces of the Eaux Claires puzzle which illustrate some of what I’m sharing here. First off, the musical aspect of my experience kicked off with My Brightest Diamond, which is driven and fronted by the dynamic Shara Nova, whose performance that afternoon set the stage for the entire weekend. She was passionate, emotive, and precise. Fittingly, her music is hard to classify, with its mixture of poignant lyrics, operatic sensibilities, punk edge, and various other musical influences. I walked away from her performance shaken (in a good way) and inspired. I was grateful to have a chance to meet her the next day after we both rocked out to EX EYE. She came across as genuine and dynamic, just as she was on stage the previous day. And then there was the James Blake experience. Before the Friday of the festival, I didn’t know any of Blake’s music. But, when a friend of mine suggested Blake was one of the artists he was most looking forward to seeing, I decided to check out his set. I’m glad I did. I was captivated by the electronic soulfulness Blake brought that night. While his performance was amazing in and of itself, it was (perhaps divinely) integrated with a nature experience neither he nor the EXC planners could have planned: rain. For some, standing out in a field while the rain is coming down (without a jacket, umbrella, or poncho) may sound miserable. It was anything but that for me on that Friday night. As Blake played and sang, the rain came down and the combination created something almost ethereal. While a dry James Blake set would have been great, there was something about the falling drops that made it that much more special and captivating. Another of the great surprises of the weekend for me was the Banks venue. It was the only indoor venue (a large tent) at the festival, and each attendee was issued a set of wireless headphones upon entry. At first, I thought that was a little strange, but after witnessing a portion of one of the sets there, I got it. On the first evening, I was walking around sampling various sets and wandered into the tent to catch a little of Sarah Neufield’s set. It’s really hard to describe with any kind of justice what I experienced there. Basically, the musicians stood inside a stage with three walls surrounding them. The walls were somewhat transparent, so you could see the artists to an extent. However, when they were playing, the screens were filled with lights and graphics that moved and changed with the flow of the music. I was fairly mesmerized. 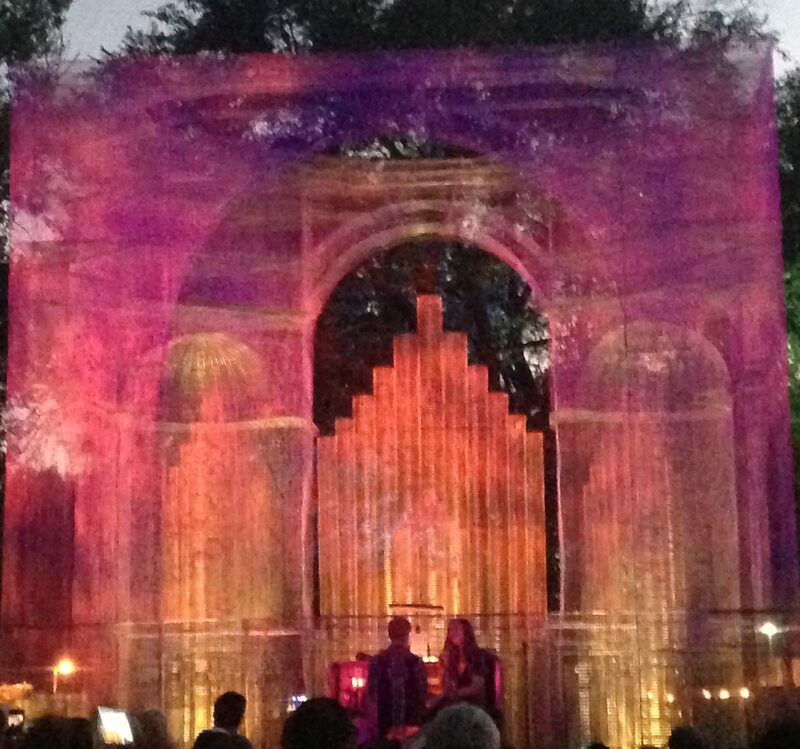 It was a tremendous and gorgeous blend of visual stimuli with creative experimental music. I came back to the Banks the next day to catch Catsax. The video below is a small piece of their show (which again, does not do justice to the experience). But, perhaps the greatest example of the continuity, connection, and expression of Eaux Claires 2016 was Bon Iver’s set itself. Of course, Bon Iver’s Justin Vernon is one of the driving forces behind the festival. And perhaps it is fitting that his set on Friday night typified much of what made EXC great. To represent this part of the weekend well in any sense, I need to start with the lead-up to Bon Iver’s set. 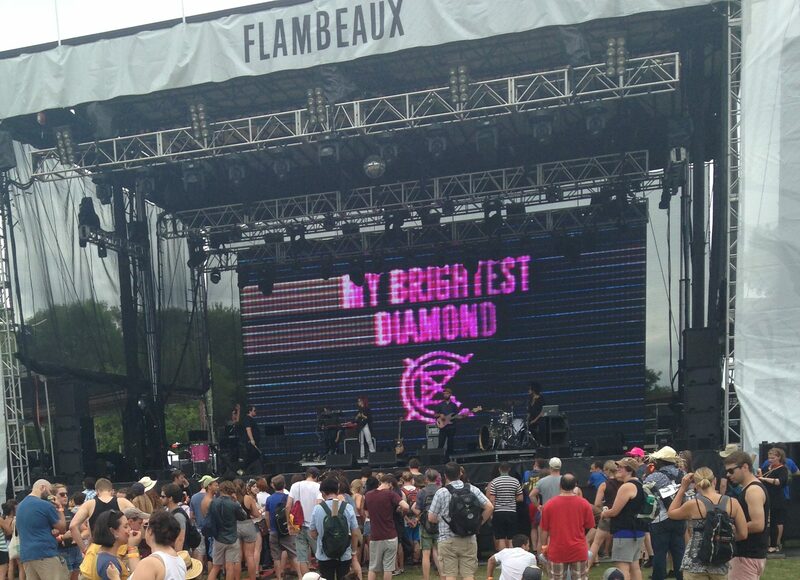 James Blake played on the Flambeaux stage across the field from where Vernon would be playing (Lake Eaux Lune). As mentioned above, his set was captivating, and it ended with an incredible loop-creating session that built upon itself repeatedly, frame after frame, until it reached its emotive crescendo. As soon as his set was complete, someone immediately began playing baroque music on the organ housed in the lighted cage pictured below. When the organ stopped, there was a short silence as everyone moved into position for the Bon Iver show. And then, after a brief introduction by Michael Perry, it began. As had been announced in the days leading up to EXC, Vernon debuted his new album, 22, A Million, that night, starting with track one and playing straight through with limited interruptions. The huge screens on and around the stage told the stories of the songs in glitchy, blurry, and colorful abstractions, which was completely fitting for the music being played. I will not attempt to describe the new songs; you need to check them out for yourself. But, the performance that night was amazing, beautiful, and inspiring, bringing together collaboration, diverse influences, visual stimuli, and the magical blend of poignant artistry and immense talent. I’ve liked Bon Iver for some time; but I became a fan that night. Note: To catch something of the flavor, check out the video below, which captures most of the performance. There are so many more dynamics of my Eaux Claires experience I could share… like hearing a heavy metal band with saxophones (EX EYE), like being drawn into the tribal rhythms and visual theatrics of Jon Mueller, like the infectious catchiness of Lucius, like the creative orchestral work of yMusic and Eighth Blackbird, like the experimental hip hop of Shabazz Palaces… I could go on and on. But, I won’t. What I will do, however, is tell you that my life was impacted deeply by this experience. It marked me to the point in which I couldn’t think of much else for days afterward. In fact, it’s just been within the last week that listening to The Space Song by Beach House no longer stirs up a bit of mourning (that the festival is over). Nonetheless, I am different after Eaux Claires 2016, and to say I am grateful for the experience feels like a significant understatement.